Months after he graduated from the University of Detroit, Elmore Leonard began writing Western fiction. In April 1951 he submitted his first Western story, “Tizwin,” to the pulp magazine Argosy. It was rejected, but an editor encouraged him to send more. “Trail of the Apache,” the third story Leonard wrote—and his first published story—appeared in Argosy’s December issue. 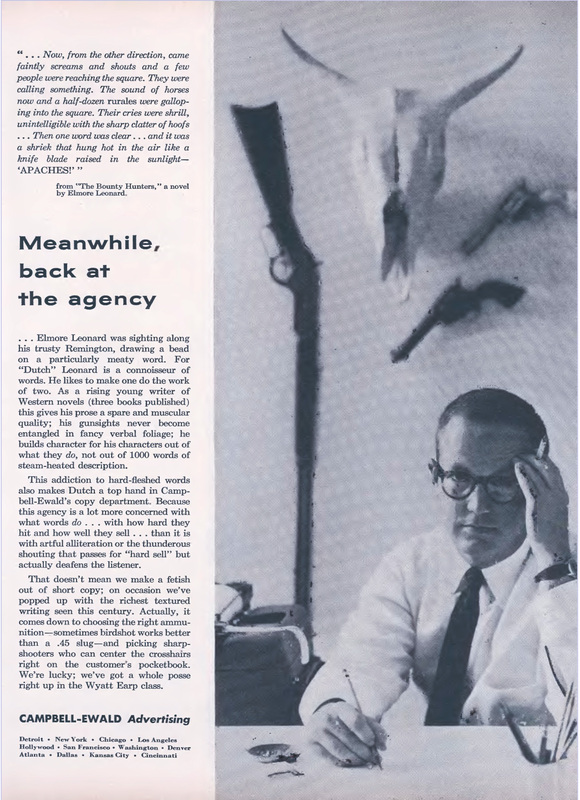 The magazine’s fiction editor James B. O’Connell cautioned him not to give up his job: “You ought to know right at the beginning that writing for a living is a most hazardous occupation.” By the mid-1950s Leonard had developed a routine, getting up each morning and writing for two hours before making breakfast for his kids and heading to a job as a copywriter for the advertising agency Campbell-Ewald. “I had a rule that I had to write a page before I put the water on for the coffee,” he said later. October 6, 1956, issue of The New Yorker (click to enlarge). That doesn’t mean we make a fetish out of short copy; on occasion we’ve popped up with the richest textured writing seen this century. Actually, it comes down to choosing the right ammunition—sometimes birdshot works better than a .45 slug—and picking sharpshooters who can center the crosshairs right on the customer’s pocketbook. We’re lucky; we’ve got a whole posse right up in the Wyatt Earp class. Three years later, however, Leonard’s agent Marguerite Harper urged him to switch genres because of the declining market for Western fiction. Eventually, in 1966, after five years away from writing any fiction, Leonard finished his first non-Western novel, The Big Bounce—which was a bit of a flop, both as a book and two movies. Fortunately for readers, Leonard’s first experience with crime fiction didn’t discourage him from sticking with the genre, and he even brought back Jack Ryan in the 1979 novel Unknown Man No. 89. Although the remainder of his career was devoted mostly to crime fiction, Leonard continued to publish Westerns into the 1980s and many of his early works remain popular with readers and critics. All told, he wrote thirty Western short stories and eight Western novels. The best of these works, four novels and eight stories, are collected in the newest Library of America volume, Elmore Leonard: Westerns—which features an image from the photo shoot for that 1956 Campbell-Ewald ad on the jacket front. 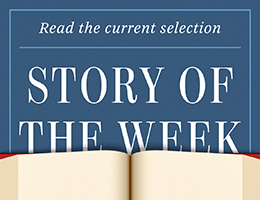 You can read “Three-Ten to Yuma,” one of the more famous stories in the collection, at our Story of the Week site.